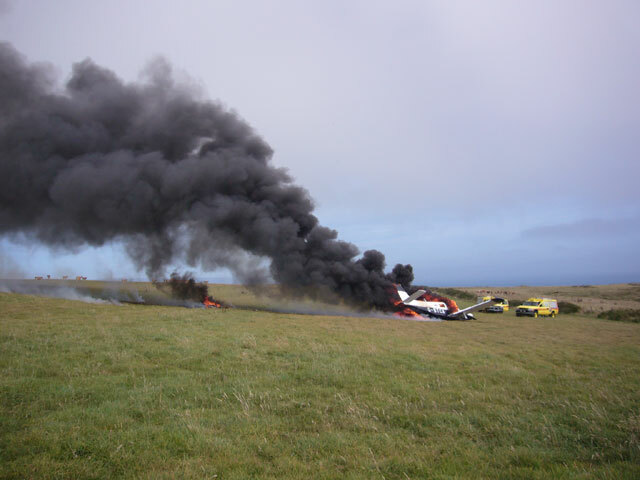 Four people escaped - three with minor injuries - after their plane crashed and burnt in Alderney. The Piper Cherokee PA32 light aircraft swayed out of the sky into a farmer's field - just 500m from the airport runway - shortly after 1pm on Sunday. Skid marks in the field show the plane slid more than 150m before coming to a halt just 30m from the edge of a cliff in the Voueme region of the island. Miraculously, the two couples on board, one from Shropshire, the other from Wiltshire, escaped the burning wreckage before fire crews, St John Ambulance staff and police arrived. One of the passengers, 40-year-old Katie Farrell, was later taken to Guernsey's Princess Elizabeth Hospital after suffering a knee injury. The co-pilot, Graham Greaves, was unhurt and accompanied Miss Farrell to Guernsey. The pilot, 59-year-old Alan Radcliffe, and his wife Pam, 57, suffered minor injuries and were discharged from hospital on Sunday evening. A spokesman for Alderney Police said the plane had stalled shortly after emerging from a fog bank on its way to land. One of the island's pilots, who did not wish to be named, said the plane was probably too low and travelling too slowly to overturn the stall, meaning Mr Radcliffe was left with no choice but to crash land. Those on board are thought to have planned a short stop in Alderney en route from Jersey to Shoreham. Mr and Mrs Radcliffe, who are from Shropshire, confirmed they were OK when approached on Monday but declined the opportunity to be interviewed. Holidaymaker Mike Franklin and his son Aaron were the first on the scene. Fire fighter Mr Franklin, 38, said: "We were sat on a bench looking at the rocks when we saw the plane come across. It looked as though it was heading for the airport but it veered sharply to the left and went down. There was then a huge bang and black smoke." Mr Franklin's fire fighting instinct soon kicked in and he ran through brambles and nettles to get to the burning aircraft. "All four passengers had got out. One of the men was OK and he carried a woman out who had injured her leg. I helped the other woman across the field and got everyone away from the fuel. The pilot's face was smashed in but they were all alive and OK.
"I got them all to the side of the field, did a quick assessment and called 999 but I couldn't get through. It was frustrating as I was the one person who could tell the emergency services exactly what was going on." Eleven-year-old Aaron watched his dad help the passengers. He said: "It was quite overwhelming and a bit scary. I've watched ambulance programmes on TV but this was real life. I didn't believe it was happening." It was something of a busman's holiday for Mr Franklin, who has worked for Warwickshire Fire and Rescue for 19 years. "I'm not a hero, I'm a helper. Aaron asked what I'd have done if the people were still in the plane while it was on fire and I said I'd have tried to get them out. You just do what you have to do to help people." It was the first time Mr Franklin, from Bidford-on-Avon, Warwickshire, had seen a burning plane. "I've never seen a plane on fire before, just the aftermath. With aircraft fires it's what happens in the first few minutes that's important and the passengers did what they had to do to get out." Simon O'Gorman sped to the scene in a Land Rover from his parents' home close to the runway. Mr O'Gorman, 43, who is visiting family, said: "We were standing in the garden when we heard the plane. We hear all the planes so know when one sounds normal. This one sounded as if it was misfiring. "There was silence before a loud bang. We saw people running towards the field and looked across to see black smoke in the air." Film producer Mr O'Gorman, who lives in Abergavenny, Wales, said he thought the passengers would be dead. "When I saw the smoke I thought I'd be dealing with charred remains and wondered how to prepare myself. "I arrived to see the plane engulfed in flames. Two ladies were lying on the ground and two men were standing up. I asked how many were on the plane and they said four. I counted four people but had to ask again. I couldn't believe they had all got out of it. "It was a startling sight. The plane was burning ferociously - it went up like a box of matches. The grass was scorched and parts of it were on fire." Mr O'Gorman added: "I've never seen anything quite as dramatic. It is incredible that they got out. Anyone who looks at the photo [of the plane landing] will ask how four people managed to survive. It's quite astonishing really." Local vet Helen Dickinson was at Alderney Horse Show, which was held around 300m from where the plane crashed. "It was a big crash," said Ms Dickinson. "We were having lunch and everyone was looking at the plane. There was a big noise and then everything went quiet. There was white smoke and black smoke and everyone gasped. We all lost our appetites for a while. We thought there was no way they would get out alive. Everyone was really relieved when we heard they were OK."
A dozen fire fighters quickly put out the blaze while Alderney's St John Ambulance volunteers treated the passengers.